And that may be all you need. The embedded post will be Facebook’s default width of 466px. If you use a wide format content area like me, you may want to embed a larger size. Facebook supports embeds of between 350px and 750px. My content area is 900px wide so I go with the largest – 750px – and wrap the embed in a div with a 75px left margin so the embedded item is centered in my posts. The simple URL method only works for status updates, image posts, videos, and shared links. If you want to share a photo album or if you want to set a custom width for the embed you can use the Embed control found on every Public Facebook post. Exactly where the Embed code option appears can vary by post type and your location within Facebook. It is usually easiest to find when you are on an a post or album’s unique page. Assuming you are using the stock post editor you can paste that embed code into your post in Text view exactly where you would like it to appear. You may want to wrap it in a block element so you can style or position it if needed. My personal preference is to create a custom shortcode with Scott Reilly’s Text Replace plugin. I get all my embeds ready in Text Replace and then when I am ready to compose, I just insert the shortcode where I want the post to appear in Visual mode so I can better picture the final layout while I am posting. This has the added benefit of allowing me to easily re-use an embed on other posts if needed. I have also found that the embedded posts appear more quickly when you use the full code embed method compared to the simple URL. 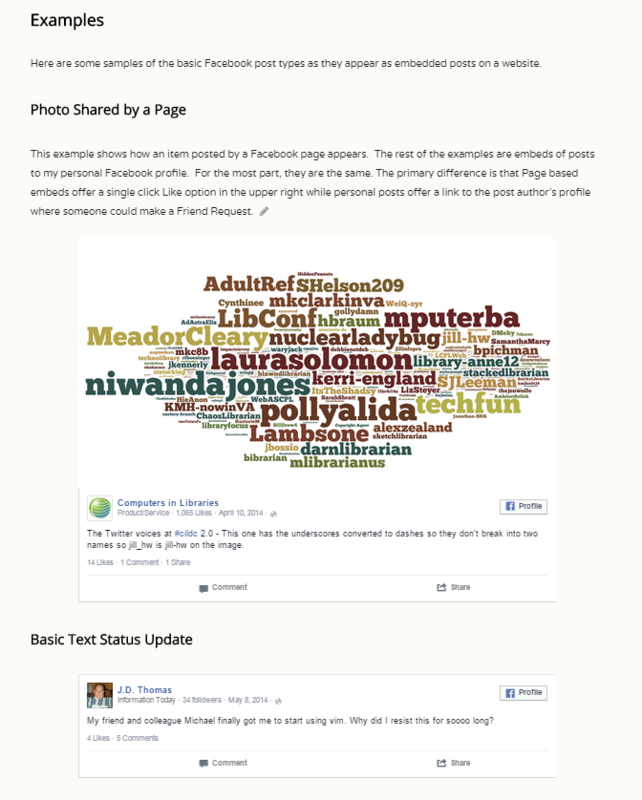 Here are some samples of the basic Facebook post types as they appear as embedded posts on a website. This example shows how an item posted by a Facebook page appears. The rest of the examples are embeds of posts to my personal Facebook profile. For the most part, they are the same. The primary difference is that Page based embeds offer a single click Like option in the upper right while personal posts offer a link to the post author’s profile where someone could make a Friend Request. Post by Computers in Libraries. It works fine for everyone I know.